As I mentioned in my post Gardening with ME: weather and energy the other day, I don't have a lot to report. After travelling in September I have spent most of October with little energy to really be able to get up to much in the garden. So this will be a shorter EOMV post than usual. In the kitchen garden, the green manure Phacelia tanacetifolia, sown after the potatoes were dug up, have grown with gusto. This was only a short-term sowing and I'll be uprooting these to make way for planting the garlic that will be going in here in November. Once I've pulled up the climbing bean canes, I'll throw the Phacelia tanacetifolia plants onto this part of the veg bed, along with the dying bean plants, before adding leafmold, in order to help improve the structure of the soil. 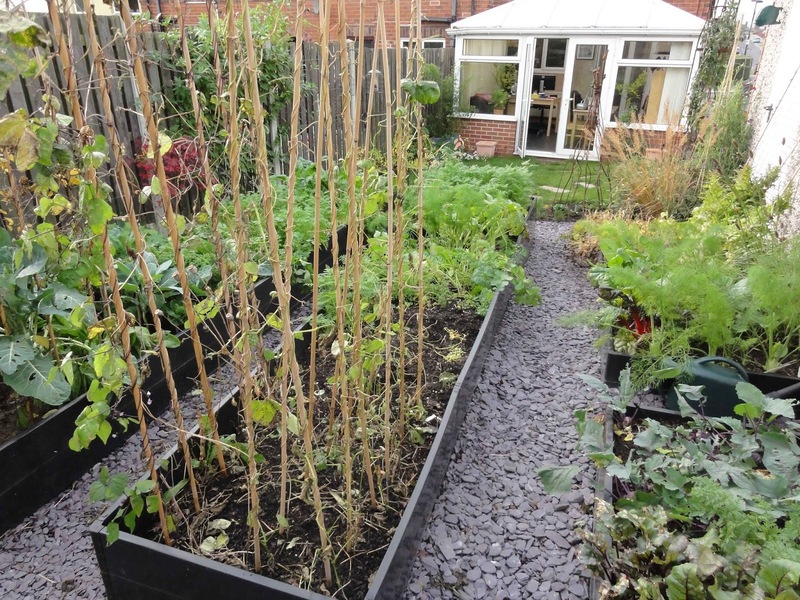 I'll be then sowing over-winter broad beans in part of the bed, and will add manure to the other part to help bulk it up and add more nutrition for the planned potatoes that will be growing in there next year. As mentioned last month, I did manage to collect some of the Dwarf French Bean Ice Crystal Wax seeds for saving and these are now drying out. I don't think the lettuce 'Bronze Arrow' is going to flower and set seed in time, so I'm hoping I'll be able to get more seed from the Heritage Seed Library and try again next year. We are still eating quite a bit from the garden: fennel (incredibly delicious) & kohl rabi, carrots, kale, spinach and chard, the last few beetroots and I have some cauliflowers that I'll be picking in the next week or so. Elsewhere in the garden, autumn is showing, though I feel I maybe need to add more to bring interest to the garden at this time of year. The yellowing leaves are from my Morello Cherry tree, and the red is Acer palmatum 'Bloodgood'. 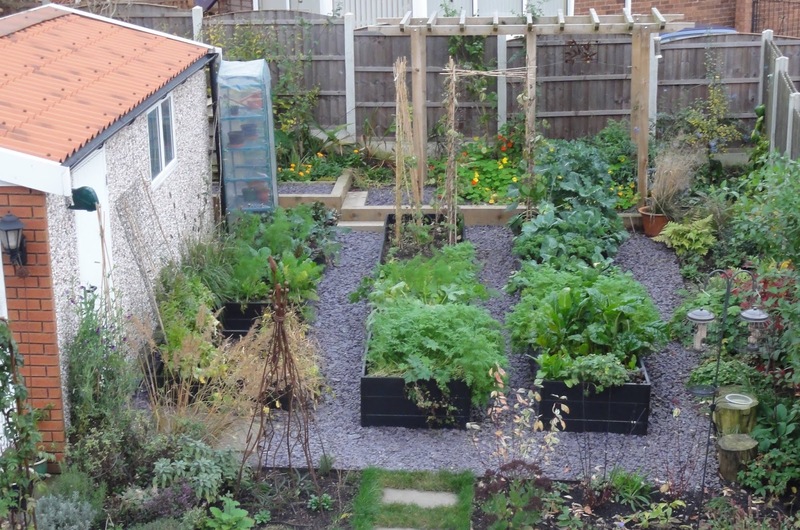 It's kind of hard given the size of the garden and how much of it is given over to vegetables (which I don't regret, btw! 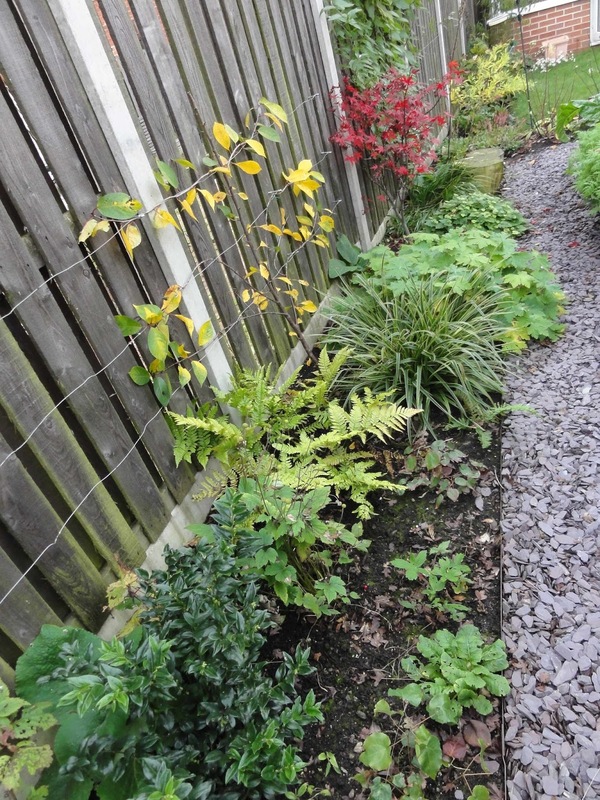 ), but I'm sure I could add something to the shady border to give it more height and colour in autumn, particularly as it will take several years for the cherry and acer to really grow and fill out the space. Something to think about. I have discovered a problem in the Shady Border, shadier end, with quite a lot of moss starting to grow here. A combination of the recent wet weather and the fact that from mid-September onwards this area doesn't get any direct sun, I believe has led to this. As the plants grow more and fill out the border this won't be so obvious, but I'm not sure if I should try and get rid of the moss and add something, such as woodchips, in the meantime? Or would woodchips only make it damper and more likely to let moss develop? Or should I not worry about the moss? I'd appreciate any suggestions you have please! One surprise has been my sweet peas, which suddenly have taken off again. 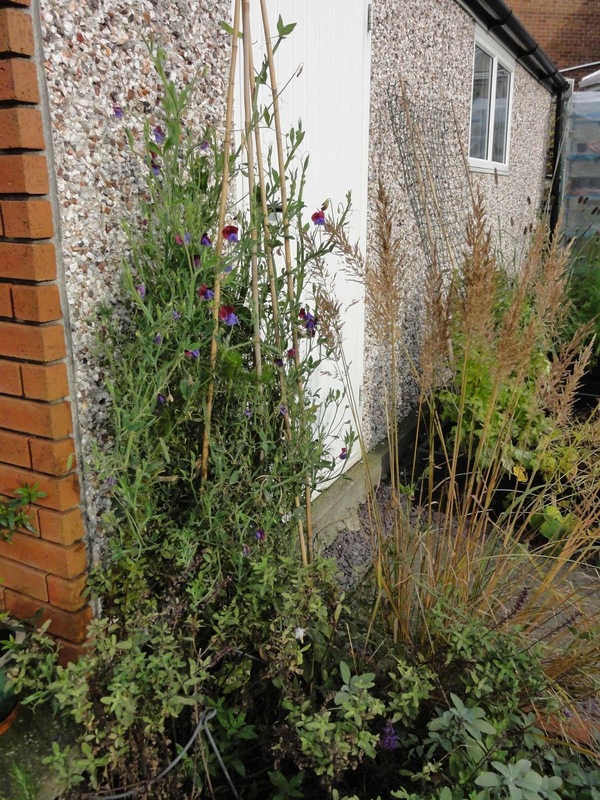 In fact the plants look healthier now than they did in summer. I'm making the most of them whilst they last. I haven't got any bulbs planted as hoped at the end of last month, so with luck I'll be feeling a bit better in November and will get these planted. October was quiet in the garden, and whilst I couldn't be out there much, I have enjoyed viewing the garden from the study. When you cannot garden physically, you can still garden in your head. End of month view is hosted by Helen Johnstone, aka @patientgardener. Visit Helen's blog for her October 2014 EOMV and links to other bloggers EOMV posts. There is much to be said for gardening in your head, I find! It doesn't matter if it suddenly starts raining, for starters! 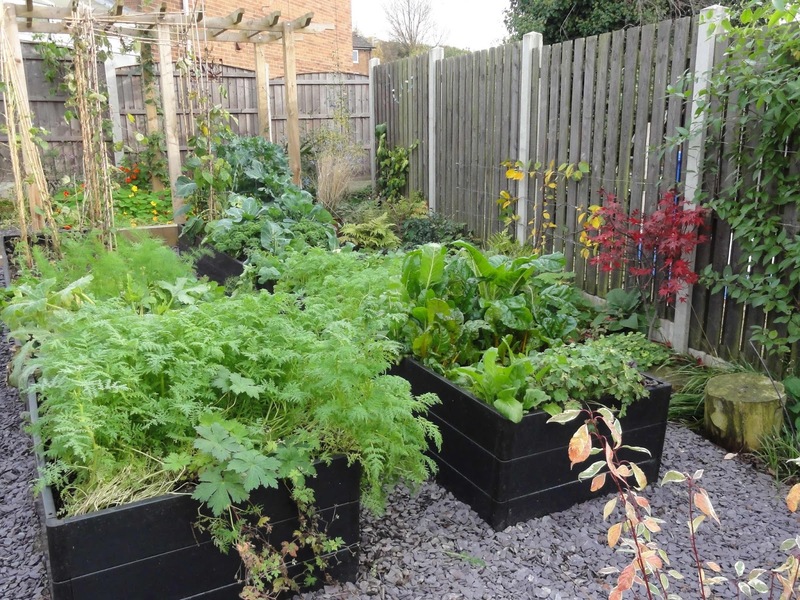 I think you have done amazingly well in your veg patch, in fact you should be really proud of what you have achieved in your whole garden, plenty of people with full health would struggle to match it. As to the moss, is it really a problem? Mulching with compost and leaving the worms to dig it in would improve the drainage, but as long as the plants are still thriving I wouldn't worry. I do hope you feel well enough to get those bulbs in Julieanne. Have you considered doing them in pots and when/if you are felling like it pop them into the ground come spring just in time for flowering. I often do this with bulbs, it helps me pick the right spot as I can never get them in quite the right place autumn and they tend to need moving! I wouldn't worry about the damp mossy patch. Give it just a general hoe over, it's what I do. I find it has no effect on the plants, providing they will grow in those conditions. 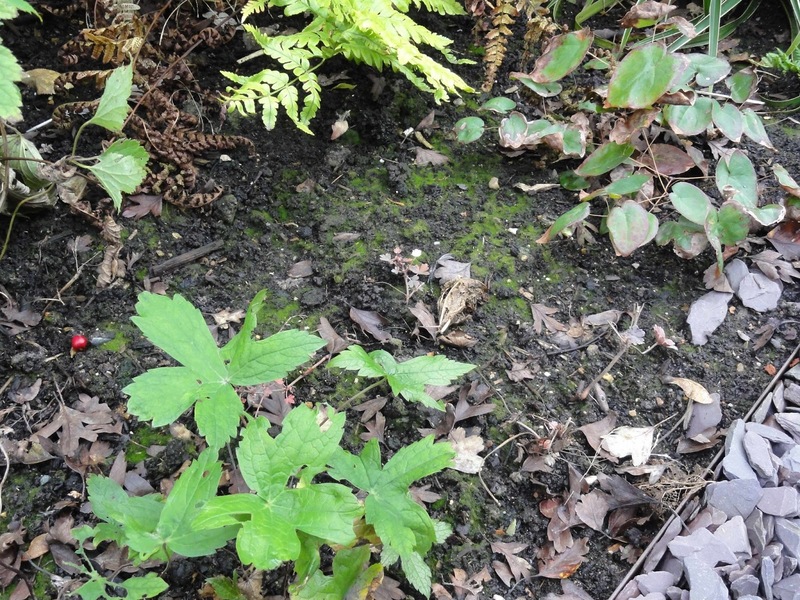 Even plants in the sunniest of borders can get moss if planting is dense enough. Good to read to that you are still sourcing vegs from your beds. I meant to add that I find that putting wood chippings down in damp shady spots only provides places for slugs to over winter and lay eggs, also not forgetting that wood chips can often mean mushrooms appear. The view from the study looks good, a great vantage point for planning. Living in a much damper part of the country I have a lot of moss too. It tends to occur where the soil is poorly drained, so I try to keep those areas well forked over and it seems to help. I haven't tried woodchips, it's a thought! Janet/Helen/Angie/Jessica: thanks all very much for your advice re the moss. I was really worried for some reason, so it's good to know I don't need to worry. And yes, I will leave off adding woodchips, but will add more mulch & try to fork it over/areate it more often. Angie: Yes, good idea about the bulbs in pots if I don't have the energy to do them. It doesn't have to be done in November, given that in the past I've not got some bulbs into the ground until January and they are still flowered well! The pots idea is a good back up. Jessica: yes I do sometimes just enjoy the view and plan. I can also see the bird feeders from the study, so sometimes it's quite entertaining just watching the birds.